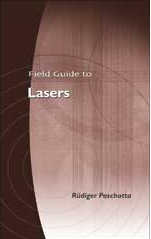 In early 2008, RP Photonics published the “SPIE Field Guide to Lasers”. This handy book (spiral bound, 152 pages), which soon became a bestseller, provides an overview on the essential types of lasers and their key properties, as well as an introduction into the most important physical and technological aspects of lasers. Apart from describing the basic principles, it discusses the numerous important properties of laser crystals, the impact of thermal effects on laser performance, methods of wavelength tuning and pulse generation, and laser noise. Practitioners will also gain valuable insight from remarks on laser safety and obtain new ideas about how to make the laser development process more efficient. This Field Guide can be purchased on the SPIE website and is also available in the SPIE Digital Library. You can order this Field Guide on the SPIE website. You will also find it at the SPIE booth during various conferences and exhibitions.